In 1898, the main English Methodist newspapers and magazines (the Bible Christian Magazine, the Free Methodist, the Methodist Recorder, and the Methodist Times) largely ignored the Dreyfus Affair , but by July 1899, they were all publicly defending and sympathising with Captain Dreyfus. In July 1899, the Bible Christian Magazine applauded the French Judges who quashed the original “conviction of Dreyfus,” which, the magazine concluded, had been shown to be “obtained by wholesale perjury and forgery.” The magazine depicted Dreyfus as the victim of a sinister plot. In September, the magazine contended that not just Dreyfus, but the French nation was on trial at Rennes. The magazine suggested that the nation’s statesman, administrators and army stood before the eyes of the world, “a discredited product of the age.” In October, the magazine observed that it was not concerned with Dreyfus as an individual per se, but rather with the French people, who were close neighbours, with a history closely interwoven with that of the English. The Bible Christian Magazine claimed that it desired to avoid anti-French sectarianism, noting that “their downfall cannot profit us; their shame is a menace to us, for as they sink they tend to drag us with them.” The magazine thus wished to avoid condemning France to oblivion, desiring instead to restore “a sane France, a justice-loving France, a pure France.” The paper expressed its hope that France would consider the judgement that has been passed upon her by popular opinion across Europe, overcome the “flood of corruption and perjury,” and free herself from “Jesuitism.” See “Dreyfus,” Bible Christian Magazine, July 1899, 471-472; “Distraught France,” Bible Christian Magazine, September 1899, 609; “Our Next Door Neighbour,” Bible Christian Magazine, October 1899, 676-677. The Free Methodist only contained a few very short reports on the Dreyfus Affair. In September 1899, the paper stated that the verdict at the retrial of Dreyfus excites “mingled feelings of compassion and indignation. Deep sympathy is felt for Captain Dreyfus and his noble wife. To be condemned again after suffering five years’ torture on Devil’s Isle … is very hard indeed.” The paper attributed the verdict of the judges in favour of the army rather than Dreyfus to “stupidity,” “prejudice,” and “moral cowardice.” The Free Methodist linked the Dreyfus Affair to Catholicism and the Pope, arguing that: “the Dreyfus case makes a startling revelation of the corrupt condition of the Church of Rome. The clerical papers of France, and notably those conducted and influenced by priests, have clamoured for this cruel and unjust verdict. The Pope and the bishops have maintained a criminal silence, and the Church which claims to be the true body of Christ has never one word in favour of mercy towards a man who, like his Divine Lord, is a persecuted Jew”. The Free Methodist attributed the “corruption of France and the unjust condemnation of Dreyfus” to “the clerical education system … and the hypocrisy of French priests.” The paper approved when the French Government pardoned and released Captain Dreyfus, and wished him a quick recovery. The paper noted that Dreyfus and his friends should not content themselves with a mere release, as his good name needs to be restored. The paper stated that it is doubtful however that the reputation of “the Church of Rome” can be restored after its “cruel persecution of Dreyfus.” “The Catholics who rejoiced and praised God for the outrageous judgement of Rennes have dealt their Church an irreparable blow,” the paper concluded. See “Notes and Comments,” Free Methodist: 14 September 1899, 625-626, and 28 September 1899, 657. The Methodist Recorder similarly defended Dreyfus, and attributed the injustice to so-called “Jesuitry”. On 14 September 1899, the paper reported that “it is no exaggeration to say that the act of the Court Martial at Rennes, or rather the act of the five military Judges who re-condemned Captain Dreyfus, has filled the whole world with horror and amazement.” Only the “Anti-Semites and the Jesuits,” the paper suggested, were likely to be pleased with the result. The paper observed that France as a whole should not be condemned, as a large number of people in France believe in the innocence of Captain Dreyfus, and sympathise with the indignation felt by other nations regarding the verdict. “France is not wholly given over to fanatical Jew-baiters, idolaters of the Army, and Jesuitry,” the paper reported. The Methodist Recorder defended English Catholics and Cardinal Herbert Vaughan (the Archbishop of Westminster), noting that “the English Roman Catholics largely share the indignation of their protestant neighbours,” and that “even Cardinal Vaughan himself is on the same side.” The Methodist Recorder was probably swayed by the more positive articles in English Catholic newspapers (including the Tablet) defending Captain Dreyfus at the end of the affair (i.e. in late 1899). See “Editorial Notes,” Methodist Recorder, 14 September 1899. Despite the comments in the Methodist Recorder defending Cardinal Vaughan, earlier articles in Cardinal Vaughan’s own newspaper, the Tablet, the semi-official newspaper of the English Catholic hierarchy, were bitterly hostile towards Captain Dreyfus, and portrayed his various defenders as part of an anti-Catholic Jewish-Masonic alliance. For example, when Captain Dreyfus was accused of treason at the end of 1894 and beginning of 1895, and sentenced to exile and imprisonment on Devil’s Island, the Tablet was very quick to believe the accusations. The episode according to the Tablet did not merely demonstrate the guilt of one man, but also revealed the so-called growing power of the Jews and Freemasons. In January 1895, the Tablet contained a report in its Paris news section, stating that “there can be little doubt that the trivial punishment inflicted on Captain Dreyfus for what, in a military country like France, is one of the most heinous of crimes, is owing to the fact that he is both a Freemason and a Jew.” According to the Tablet, “while in England the Jews are a harmless and inoffensive tribe, or at most work unaggressively, in France they are the declared and open enemies of the Christian religion; using their wealth and talents to obtain official positions, and the power with which these latter endow them to strike every blow that chance may afford at the Catholic faith; and they never miss a chance.” “The combination of Judaism with Freemasonry is irresistible,” the reported stated, and “it rules France with an iron-gloved hand, and there is no disguise of velvet-covering to soften the grip.” The report in the Tablet concluded that “had a Christian been found guilty of the treachery of Captain Dreyfus he would have been shot,” whereas he “escapes with a comfortable exile, accompanied by his wife and family, and freedom to live his own life subject to the very slightest supervision.” The Tablet continued to maintain this position in 1898. The Tablet reported that “the sudden clamour for the revision of the Dreyfus trial … is a subsidized movement, financed by the moneyed interest which has made the cause of the Jewish Captain its own.” According to the report, if Dreyfus had “belonged to any other race,” there would be no agitation on his behalf. “It looks,” the paper reported, “almost as if the intangibility of the Hebrew were to be elevated to the place of a new dogma of public right, as the final article of the Jacobin creed of the Revolution.” The paper argued that the Dreyfus case has become the battleground for two opposing factions. On the one side stands “the elements that represent and constitute French nationality – the old aristocracy, the army with its Catholic traditions, and the bulk of the Catholic population.” On the other side stands the “cosmopolitan forces of international journalism, Semitic finance, and infidel letters which seek to move the world by the leverage of two great powers, intellect and money.” The Tablet was again explicit in its declaration of an alliance between Jews and Freemasons, and as it had before, it suggested that in certain circumstances, antisemitism was acceptable if regrettable. It stated that: “We shall not, we trust, be accused of palliating or condoning the excesses of anti-Semitism, by pointing out that the Jews, in France, Italy, and Austria, the three principal Catholic nations of the continent, exercise a political influence entirely disproportioned to their numbers, and that this influence is always exercised against the religion of the country. In close alliance with the Freemasons, … they form the backbone of the party of aggressive liberalism, with war to the knife against the Church as the sum and aim of its policy.” See “Notes from Paris,” Tablet, 12 January 1895, 58; “Antisemitism in the Austrian Election,” Tablet, 27 March 1897, 481-482; “Captain Dreyfus and His Champions,” Tablet, 12 February 1898, 238. Whilst the Methodist Recorder was relatively conciliatory towards Cardinal Archbishop Vaughan and English Catholics – though on 5 October it was critical about Vaughan’s decision to defend the Catholic newspapers’ handling of the Dreyfus Affair – it did report that “the authorities of the Church in Rome, if only because of their silence, cannot be held blameless in the matter. The Pope and his Cardinals may not have had it in their power to prevent the result, but they might, at least, with their great authority, have imposed silence upon those priests in France, who, though a fanatical Press, have inflamed the popular provincial mind.” It invoked Pilate and the image of the crucifixion as an analogy to condemn those who condemned Dreyfus. It stated that the Pope and his Cardinals have “elected to play the part of Pilate and Caiaphas in another tragedy. 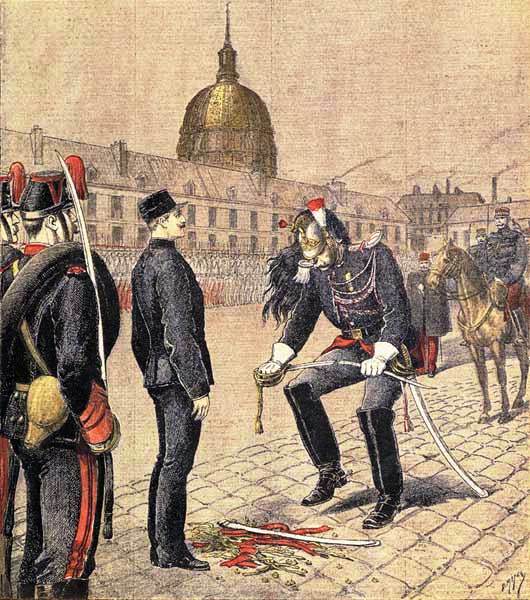 Knowing, as they must have done in their secret hearts, that an innocent man was being martyred, they were content to let events take their course.” On 21 September, the paper applauded the pardoning of Dreyfus, noting that “no French Government would dream of pardoning an officer of the General Staff twice condemned if there were even the shadow of a doubt as to his innocence.” It again condemned “the forgers and conspirators and liars” who “go scot free, except that they are execrated not only by the world outside France, but by the best and noblest of their own countrymen.” Significantly, the paper argued against an agitation for the boycotting of the Paris Exhibition that was planned for 1900, which it regarded as unfair and unwise, as “the rotten section of the French army is not France, nor is that blind and mad section of the Roman Catholic Church of France of which ‘La Croix’ is the organ, nor yet those dregs of the French Press which stand for all that is unjust and inhuman.” English people should not hate France in general the paper concluded, but rather “honour the noble minority – if minority it still is – that has pleaded for justice to the falsely-accused.” The paper did however “confess to an intense desire to see justice avenged on the real culprits in this great drama.” See “Editorial Notes,” Methodist Recorder: 14 September 1899, 3; 21 September 1899, 3; 5 October 1899, 3. Of the Methodist newspapers and magazines in 1899, the Methodist Times contained the most prominent anti-Catholicism in its reporting of the Dreyfus Affair. The Methodist Times argued on 21 September 1899 that the Jesuits were to blame for the Dreyfus Affair. Furthermore, whereas the Methodist Recorder mostly defended or praised English Catholics and Cardinal Archbishop Herbert Vaughan, the Methodist Times excoriated Vaughan for his attempts to deflect just criticism, and, quote, “his silence and the silence of all the English Romanist Hierarchy, when every other Christian Church is protesting against the wicked verdict of Rennes.” According to the Methodist Times, Vaughan was the “docile pupil of the French Jesuit school” (in reality, there was no connection between Cardinal Vaughan and the French Jesuits – but his newspaper the Tablet had excoriated Jews and Captain Dreyfus prior to 1899). “The Dreyfus case and the rotten condition of the French Army,” the Methodist Times argued, was “the direct result of the momentous fact that the Jesuits now dominate the French Roman Catholic Church.” The Methodist Times argued that the “great political and ecclesiastical fact of our time is that the Jesuits, after centuries of strife, have at last captured the whole machinery of the Roman Catholic Church, and are gradually crushing out of that Church all those who do not accept their views and methods.” “The more Liberal and manly American Romanism lies prostrate in the dust under the foot of Spanish Romanism,” the paper concluded. Furthermore, the Methodist Times blamed the Jesuits for events throughout Europe: “the Jesuit organisation has brought France into her present position, keeps the unity of Italy in constant peril, threatens the German Empire, will certainly destroy the unity of Austria, and, mainly through Irish agency, is always secretly seeking to undermine the unity of the British Empire.” The same issue of the Methodist Times also contained a couple of reports of Methodists delivering lectures on the Dreyfus Affair and organising protests. One Methodist minister, the Rev. D. A. De Mouilpied, delivered a lecture on France and the “Dreyfus Tragedy” at a crowded chapel in York – according to the paper, 2000 congregants assembled to hear the lecture – and the Superintendent minister organised a letter to be sent from the large congregation to Madame Dreyfus to express “profound sympathy” and “confidence in Captain Dreyfus’s innocent.” The Rev. De Mouilpied then repeated his lecture at another crowded chapel in Sheffield. According to the Methodist Times, the minister declared that the retrial was not a “miscarriage of justice, for there had been no justice”; it had simply been a “cruel and infamous farce.” See “Americanism,” Methodist Times, 21 September 1899, 657; “York: The Dreyfus Tragedy,” Methodist Times, 21 September 1899, 662; “Sheffield: The Dreyfus Infamy,” Methodist Times, 21 September 1899, 662. Unlike the Methodist Recorder, the Methodist Times called for a firm boycott of the French Exhibition, and argued that “the French people are responsible” for the Dreyfus Affair. “It is transparent nonsense,” the paper argued, “to say that we must not punish the whole nation for the sins of a handful of men, or even of the General Staff of the Army.” According to the paper, the “notorious fact” is that with the exception of a small minority, the whole nation “savagely endorses the abominable crime perpetrated by the court-martial at Rennes.” It was thus morally unacceptable, the paper argued, to go “laughing and smiling and dancing to the Exhibition,” as to do so would be to make oneself party to the “Dreyfus infamy.” Only if the French people – via their Government and Parliament – repent and repudiate the infamies committed in their name, would it be acceptable to attend the Exhibition, the paper contended. See “Notes of Current Events,” Methodist Times, 21 September 1899, 664. The Methodist Times also contained other reports that were critical or hostile towards Catholicism in October and November 1899. On 26 October, the paper reported and approved a letter sent by George Mivart to The Times newspaper on 17 October, which accused the Church of silently tolerating French Catholic antisemitism during the Dreyfus Affair. In November 1899, the Methodist Times contained a number of reports that the Pope, the Jesuits, and the Catholic newspapers, hated England, and were gloating over calamities faced by the British Empire. According to the paper, “the Jesuits from their standpoint are logically justified in the hatred with which they regard us. Their sentiments are exemplified in the Dreyfus infamy. The British Empire stands for civil and religious freedom, the rights of conscience and the vindication of truth. … the official hierarchy of the Papacy is, and always has been, the deadliest enemy of human freedom and of the rights of man.” According to the paper, the Catholic Church, the Pope, and the Jesuits, are hoping for or planning the downfall of the British Empire. See “Mr. St. George Mivart and the Pope,” Methodist Times, 26 October 1899, 737; “The Pope and the Jesuits Rejoice,” Methodist Times, 2 November 1899, 760; “The Jesuits’ Position Logical,” Methodist Times, 2 November 1899, 760; “Roman Catholicism Losing Ground,” Methodist Times, 2 November 1899, 760; “The Papal Hatred of England,” Methodist Times, 16 November 1899, 796; “The Jesuit Invasion of England,” Methodist Times, 16 November 1899, 796. Nineteenth-century English anti-Catholicism probably influenced the reporting in some of these Methodist newspapers as much as any sympathy for Jews and Captain Dreyfus. For those with an anti-Catholic axe to grind, such as the Methodist Times, the Dreyfus Affair was a gift, as many Catholic newspapers, especially the French Catholic newspaper La Croix and the Rome based Jesuit periodical La Civiltà Cattolica, but also the English Catholic Tablet, were acerbically anti-Jewish and anti-Masonic during (and before) the Diana Vaughan Hoax (1894-1897) and the Dreyfus Affair (1894-1899). Anti-Catholicism in various forms has been a prominent feature of post-reformation British culture and society. According to Bernard Glassman’s study of “protean prejudice,” during the eighteenth century, “Catholics were, by far, the most despised and feared minority group in England. … If, through the years, they had been guilty of portraying the Jew as the nefarious ‘other’ who proved the superiority of Christianity by his sinister behaviour, they, in turn, were viewed in the same way by the Protestant majority.” Though the early Methodists were sometimes “accused of being ‘Papists in disguise’ or ‘Popishly inclined’”, Methodist publications during the late-eighteenth century, and throughout much of the nineteenth century, were disseminators of anti-Catholic narratives. See Bernard Glassman, Protean Prejudice (Atlanta, Georgia: Scholars Press, 1998), 35-36, 44.